All Replies on Milkman's workbench as replacement top for Workmate? Milkman's workbench as replacement top for Workmate? I have never heard of a “Milkmans Workbench” but just looked it up and I like how they are set up. I can see a lot of uses for one used on saw horses. I would think one would work very well on a couple of workmates. Instead of replacing the workmate top. I would either screw/bolt or clamp the milkman’s workbench to the workmate’s top. That way you can still have the workmate’s top by just removing the milkman. I have two bench hook shooting boards (cross wise and length wise) that I clamp to my workmate along with a side vise. As the boards have stops, I do chiseling and cross cut sawing on them, as well shooting. Other times, I find the workmate top works better, so being able to remove the boards is convenient. One thing I forgot to add. If you haven’t used a handplane on a workmate yet. Workmate’s are not the best for handplaning. They are light and not very rigid, also the length of board that can be planed is limited. I brace mine against a wall and hold it down with one foot when planing, which can be a dance on longer boards as I switch feet. Thanks for your views. 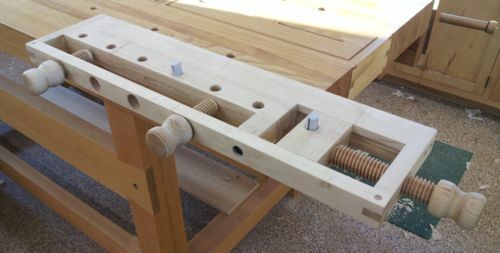 I’ve used accessory bench hooks, extra clamps, and made a mount for vise that can be clamped. But these are just more things to store and lug around. That’s why I think have them ‘built in’ might be better. Re stability issues while. hand planing, that’s why I often link two workmates (WM) together. One can also put one foot on the step, but that isn’t a very comfortable posture for planing. But there are other things that can be done. On my WMs, the base can be fitted with a 3/4 ply shelf panel, and that can be loaded with tools or weights to increase the stability. A long time ago, I’d made a panel from framed hardware cloth would hold tools and also allow dust to pass through, but that eventually wore out. Another solution could be to make a portable toolbox that fits in that space and provides weight. Here is a picture of a “milkman’s bench”, for those who never saw one, myself included. Have fun, make some dust.